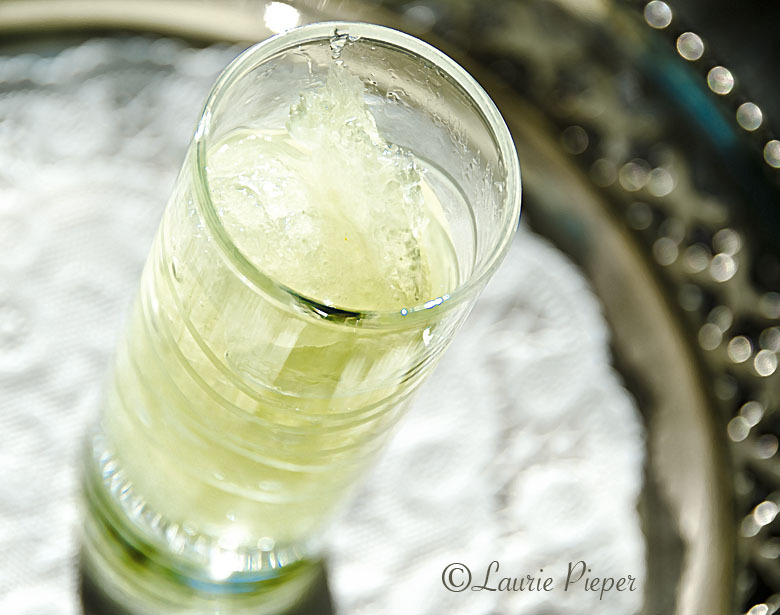 Having made Limoncello recently, I have been having fun experimenting with ways to serve the liqueur. This sorbet can be served as a palate cleanser or can be incorporated into desserts or cocktails. It is simple to make, but does need to be made a day ahead in order to have time to freeze. But that means that there is still time to make it for New Year’s Day! This Limoncello Sorbet starts out icy, but quickly melts into a slushy consistency so that it can be sipped rather than eaten. 1. Make a simple syrup out of water and sugar. Place water and sugar in a saucepan. Bring to a boil, stirring frequently to dissolve sugar. Once sugar is dissolved, remove from heat and stir in the juice of one lemon. Allow to cool. Stir in Limoncello. Pour into a glass container, cover tightly and freeze overnight. 2. Before serving, “fluff” sorbet with a fork and then divide between small glasses. (I used 2 oz. tequilla glasses.) Squirt each serving with a little bit of juice from the remaining lemon. Serve immediately.